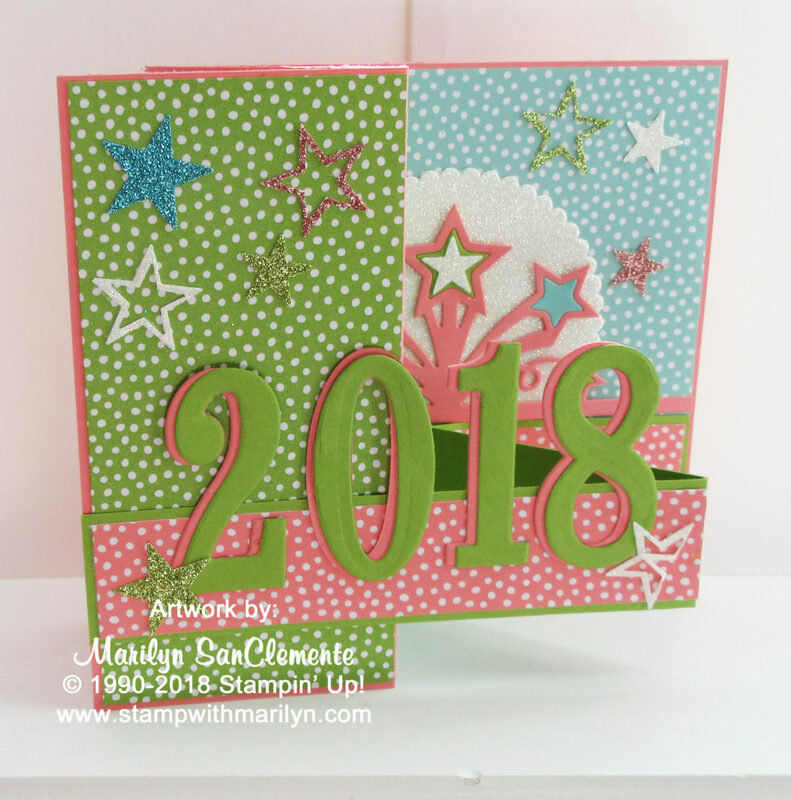 Marilyn SanClemente July 16, 2018 July 16, 2018 Stampin' Up! Today I am sharing a Handmade Graduation Card that I designed for my niece Hillary’ s graduation from Merrimack College! What a huge milestone! This is one of my favorite card designs – a Z Fold Card. I love cards that move and Z Fold Cards are one of my favorite types of cards to design! The colors for this card are inspired by Hillary’s love of Lily Pulitzer clothes and colors. Pink and Green colors happen to be one my favorite colors combinations too! So this card is designed around the new Granny Apple Green cardstock and of course my favorite pink – Flirty Flamingo cardstock wiht a little Coastal Cabana thrown in for a blue shade. Aren’t you glad that Flirty Flamingo became a permanent color and that Coastal Cabana is back! I used the Brights Designer paper stacks for the back ground paper. Bringing back the Designer paper stacks in the color families was a great decision by Stmapin’ Up! I love having a designer paper that coordinates with every color! 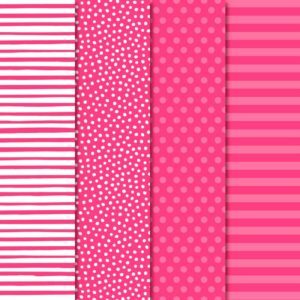 The card base is a 5 1/2″ x 11″ piece of Flirty Flamingo Cardstock scored at 5 1/2″ and 2 3/4″. This is folded into a Z shape. The first 2 layers are two 2 5/8″ x 5 3/8″ pieces of Granny Apple Green DSP. The back panel is a 5 3/8″ square of Coastal Cabana DSP. The arm of the Z Fold card is a 1 1/4″ x 11″ piece of Granny Apple Green cardstock scored at 5 1/2″ and 2 3/8″. Each panel of the arm is layered with a piece of Flirty Flamingo DSP. 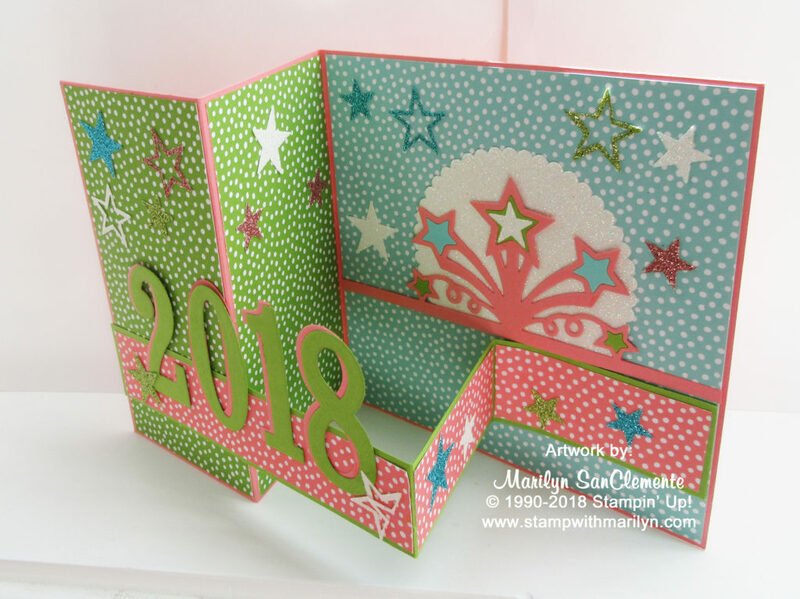 The numbers 2018 are cut using the Large Number framelits dies (which have now retired unfrotunately) from the Granny Apple Green and Flirty Flamingo cardstock. The key to the Z Fold card is to attach the arm folded in the opposite direction from the card. The banner and stars are cut using the Birthday Bash framelits (also retired). I do love these framelits and the star explosion that the die creates!. The inspiration for the card design was a graduation card that I designed last year for my daughter Emily. I have to admit that her card was a little more elaborate with a lot more bling. This card was designed around Sacred Heart University colors which is where my daughter graduated from. 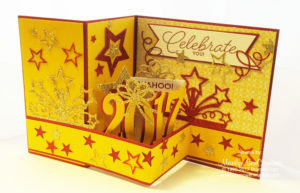 This card used Crushed Curry Cardstock and Cherry Cobbler Cardstock. This is a great example of how you can take a favorite card that you designed before and change it to use for another occasion! Want to learn how to make a Z Fold card? Here is a link to a video that I recorded last year on Z Fold cards. I also included a link to FREE PDF with full instructions on making Z Fold cards! Beautiful I love Z fold cards, you vdo awesome work.